Was Stanford University Actually Supposed to be in Albany? – Hoxsie! Was Stanford University Actually Supposed to be in Albany? A long time ago, before Hoxsie even began, we told the story, of how some local pettiness caused Leland Stanford to take the millions he intended for establishing a university in memory of his deceased son across the country, where he established Leland Stanford, Junior, University in Palo Alto, CA, instead of in Albany. We knew it was possibly apocryphal but delicious and oft-repeated nevertheless, It shows what we think of our provincial attitudes that it seemed highly believable. As we told the story years ago, Leland Stanford, born to prosperous farmer, innkeeper and contractor Josiah Stanford in 1824 in what as then called Watervliet (now Colonie). Leland left home at 17 to study in Clinton (the Clinton Liberal Institute) and Cazenovia (Cazenovia Seminary), returned to Albany to apprentice in law, and was admitted to the bar in 1848. After marrying Jane Lathrop, of another prominent local family, he moved west, following two of his brothers to the gold rush. He rose from owning a retail store in Sacramento to become governor of California, the same year that he was a founder and president of the Central Pacific Railroad Company. That made him some money. So how did Stanford University end up in Palo Alto instead of Albany? If the Troy Press were to be believed, it was the greed of the cemetery association, whose officers “it is said, knowing Mr. Stanford’s great wealth and his greater grief, seemed to be of the opinion that they could get from him a little more for the mausoleum site than a person of ordinary means would be asked. The sum which it is said they endeavored to extort was $75. . . .” [about $1,700 in today’s money]. Stanford may have been fabulously well-to-do, but apparently he didn’t like being taken advantage of. The Press said that on discovery of this fact, “He shook the dust of Albany from his feet and went back to California, where he immediately entered upon the development of his university project.” He endowed the new university with $20 million. And he put his son’s mausoleum on his own unfinished new estate, which became the home of Stanford University. After Leland died in 1893, Jane led the development of the university. Paul Grondahl, in “These Exalted Acres,” gives an alternate version of the story that the Troy Press told, and adds a bit of reason instead of spite to Stanford’s action. He reports that Stanford wanted 350 acres, “which was more than three-quarters of the cemetery’s 467 acres and that much land was not available. Neither could Stanford’s millions put together a parcel that large around his family’s homestead in Watervliet (present-day Colonie).” In this version of the story, we’re talking about much more than just a mausoleum — we’re talking about a university erected in memoriam of Leland Junior. That’s why the need for so much acreage. Under this theory, it wasn’t extortion by the cemetery board that caused the departure for points west; it was simply a lack of available real estate. Oh-ho. He said that, did he? A few days ago a Troy paper published a sensational story to the effect that the Hon. Leland Stanford of California, a former Albanian, had intended to erect a family mausoleum in the Albany Rural cemetery and establish here the great university which bears his name, but that a petty exaction of an increased price for cemetery lots in his case on the part of cemetery officials so disgusted him that he shook the dust of Albany, his old home, from his feet and settled upon his new home as the site for these great monuments. A letter of inquiry was addressed to Senator Stanford, and this response was received. The price of lots in the Albany cemetery had nothing to do with my final determination as to a family burial place. I concluded that the best site for a family tomb was on the grounds that would belong to the university. I do not remember ever to have had under consideration any other place but Palo Alto for the location of the university. Yours very truly, Leland Stanford. Couldn’t be much clearer than that. So we’ll have to admit that although we loved the idea that we wuz robbed of what became one of the world’s premiere universities, it turns out we were never even in contention. We should note, though, that Grondahl reports there are still some ties between west and east. 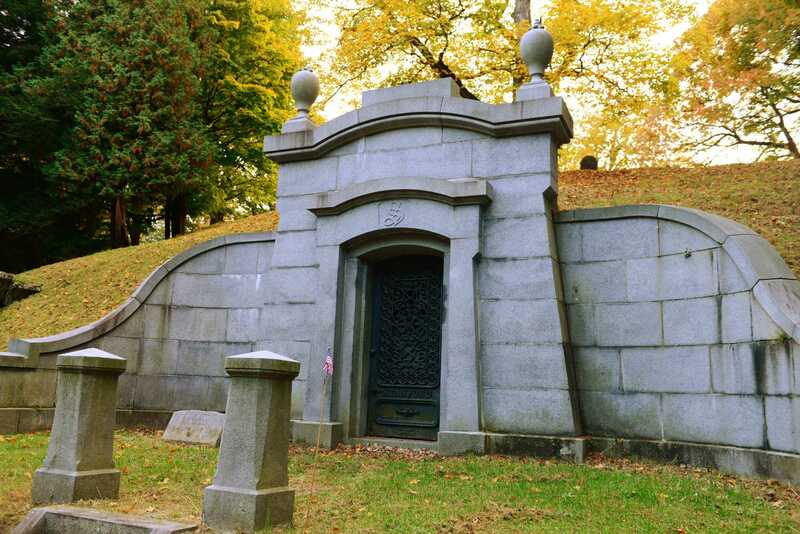 He wrote that a Stanford alumna visiting Albany Rural Cemetery in 2000 was alarmed by the deteriorated condition of the Stanford family mausoleum, and through a gift to and through the university, the stones and walls of the crypt, which is set into a hillside, were reset. It is quite lovely today.